Volunteer Movement of Ukraine expressed their gratitude and a big Thank You to the US non-profit Nova Ukraine from the delegates and participants of the First Ukrainian Congress of Volunteers. 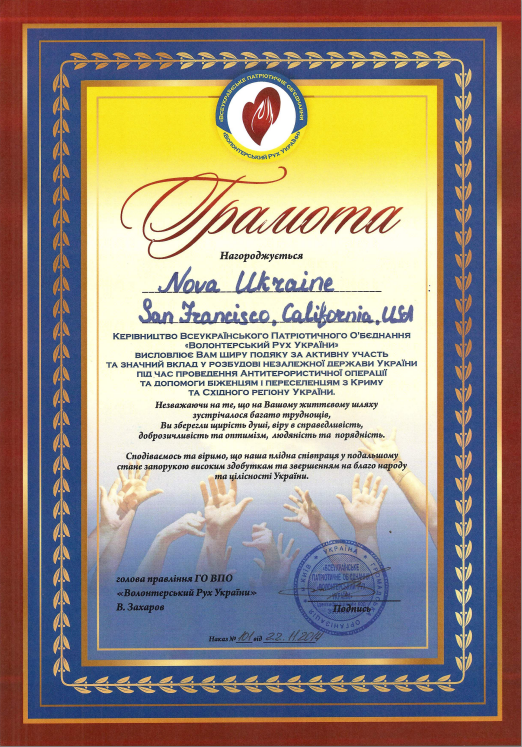 The Congress of Volunteers made a decision to award Nova Ukraine, USA, under the guidance of Nick Bilogorskiy, with a Certificate of Honor from Volunteer Movement of Ukraine for providing consistent support to internally displaced persons and refugees, children and mothers from the Crimea and from the ATO zone. The Congress of Volunteers also decided to accept Nova Ukraine as an acting and honorary member of Volunteer Movement of Ukraine. The Certificate of Honor will be sent to the non-profit shortly. Glory to Ukraine! Here is the image of the award. No Replies to "Nova Ukraine was awarded with a Certificate of Honor from Volunteer Movement of Ukraine"